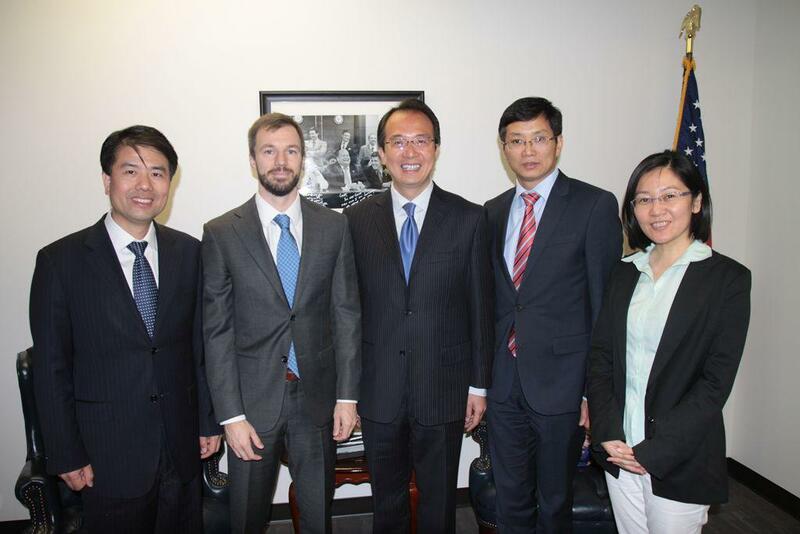 On September 6, Consul General Hong Lei visited U.S. Senator Cory Gardner's Denver office and met with District Director Chuck Poplstein. Following a introduction of exchanges and cooperation between China and the State of Colorado and Sino-U.S. Relations, Consul General Hong Lei said China and U.S. account for one fifth of global population, one fourth of global trade, one third of world GDP. The two countries share huge common interests and shoulder the growing responsibility in safeguarding world peace and prosperity. Chinese Consulate General stands ready to work closely with the District Office so as to promote Sino-U.S. relations. Chuck Poplstein welcomed Consul General Hong Lei’s visit and recalled his trip to China a month ago. Poplstein said he was impressed deeply by the rapid economic and social development in Beijing, Shanghai and other Chinese cities. The U.S.-China relations are of great significance, and the two sides should continue to strengthen exchanges and cooperation in trade, investment, tourism, culture and other fields. The District Office is willing to stay touch with Chinese Consulate in Chicago.